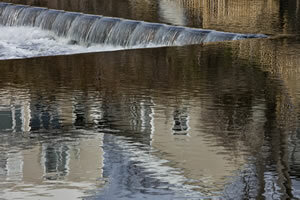 In 2002 theHumm featured Almonte photographer Alan Mirabelli in an article titled “Seeing with New Eyes”. After enjoying his compelling images of nature in a recent show in Almonte, we selected Mirabelli as the first (of the almost 200 artists we have featured previously) to be revisited. We are delighted to report that his aesthetic sensibilities remain as fresh and evocative as ever. Whether it’s a gnarly tree trunk or a collection of decaying autumn foliage arranged by chance, Mirabelli captures an image that speaks to our nature-deprived souls. Most of us forget to look, so we don’t see. Mirabelli looks, he sees, and he creates beautifully executed images that invite us to explore his meditations on the passage of time — the corrosion and renewal that are the tensions of life. Photography was his salvation during a mid-life crisis and depression seventeen years ago, and it persists as his lifelong companion and raison d'être. It is how he experiences life and interprets his own emotions. It is through his ongoing examination and appreciation of the marks made by nature that he understands Life in general, and his own life in particular. “My photographs are like punctuation marks in a journey… an echo of time. My object is to explore, to feel, to see anew, to journal visually. Each image is a topographic map of emotion… a moment chosen, a choice to stand still…” Our conversation reminds me that the man is as poetic with words as he is with images. Carrying his camera reminds him to be attentive, to live in the moment, and to contemplate existence and the meaning of life. Behind a lens he is free — safe to experiment and explore. He describes his images as “a reflection of a frame of mind, an act of humility, and a moment of wonder.” His photographic meditations are mementos of precious moments. They are how he remembers, and how he will be remembered. The perfect way to insult a serious photographer is to say, “Oh. I love your photo. You must have really good equipment.” It immediately brings to mind one of my favourite adages: “A fool with a tool is still a fool.” Fortunately, a genius with a camera remains a genius even when he is forced to recognize the limits of his body and to adjust his equipment accordingly. Mirabelli has been delighted to discover that his exploration behind the lenses of lightweight, highly streamlined photographic technology remains as satisfying as when he was lugging around much larger and heavier gear. It doesn’t hurt that he has paid his dues and mastered the tools and techniques of the medium throughout the past forty years. He supported himself through university by shooting weddings and bar mitzvahs, and continues to bring a film aesthetic to digital image making. Today he uses state-of-the-art hardware and minimal post-processing software to emulate his favourite Fuji/Velvia film. A generous man with his talents, Mirabelli has provided photographic services for charitable purposes, and he has photographed the works of many fellow artists. A resident of Appleton since 1981, he is a valued fixture in the area’s artistic community where he has made many friends. His current project is dedicated to documenting their artistic lives photographically. 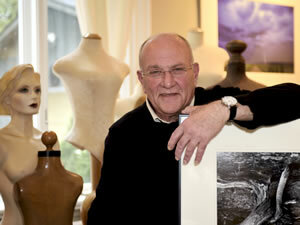 With no firm timetable, his plan is to create a book celebrating forty to fifty local artists. The undertaking is already underway and he views it as an exciting continuation of his personal growth through photography. The project provides the opportunity to transfer all of the lessons he has learned by photographing nature since his retirement as Executive Director of Administration and Communication at The Vanier Institute of the Family eight years ago. To him, landscape photography involves a personal conversation — an exploration of the innumerable choices of subject, composition, lighting, story and emotional impact. What is important is being attentive and patient, and not having a pre-conceived notion of what the image should be. His goal is always to interpret, not to record. In addition, Mirabelli believes that portraiture can only succeed as a collaboration based on trust. His goal is to understand how his subjects think and feel in order to honour them and their art. He looks forward to becoming truly engaged with how they work to create environmental and situational portraits. With confirmed participants such as sculptor Sue Adams, stone sculptor Deborah Arnold, textile artist Maggie Glossop, clothing designer Paddye Mann (RCA) and visual artist Mary Pfaff, the book is virtually guaranteed to be an arts lover’s treasure. In the meantime, February in Ottawa is a great time to contemplate Alan Mirabelli’s evocative photographic meditations on nature’s beauty, mystery and power. From February 2 to March 5 you can form your own interpretations of his stunning photos on display at The Ottawa Art Gallery in Arts Court at 2 Daly Avenue. Titled “Earth’s Textures: Moments of Stillness”, his images seduce the soul as well as the eye. For full contact details, a photo gallery of Mirabelli's work and more, follow the links at the top of this page.